Since 1978, we’ve been a mainstay for the packaging industry. If you are facing a performance or quality issue with your corrugator, we have the experience and expertise to solve it. The HarperLove sales and technical team has more than 400 years of accumulated experience with our company and over 1,200 years of experience in the corrugated industry. With that unequalled level of experience, we have become deeply integrated into our customers’ operations. 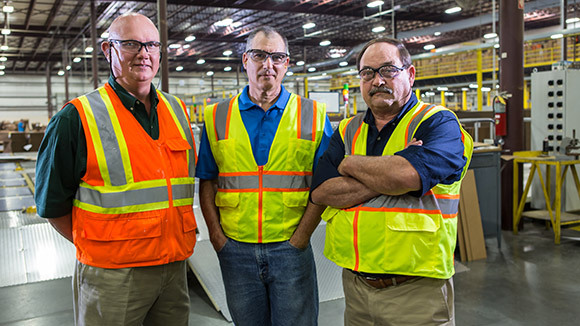 Our people know corrugated, adhesives, and converting equipment like no others. We have worked in every aspect of corrugated manufacturing, including maintaining the machinery, managing people, and meeting difficult production goals and budgets while keeping customers satisfied. We are methodical goal-oriented people motivated by what you want to accomplish. When a member of the HarperLove team arrives at your plant, you can expect the best set of solutions to meet your specific challenges. Alan joined HarperLove following an 18-year career with International Paper in a progression of management positions in the packaging and distribution businesses. Prior to International Paper, Alan was a Senior Engagement Manager for the international consultancy, McKinsey & Company, working in their Dallas, Houston and Atlanta offices. He earned his Bachelor of Science degree in Electrical Engineering from North Carolina State University and his Master’s degree in Business Administration from Harvard University. Thomas came to HarperLove after 16 years as the CFO of General Microcircuits, where he was instrumental in establishing sourcing relationships in Asia and manufacturing capabilities in Central America. Thomas is a North Carolina native and earned his Bachelor of Arts degree in History from Davidson College and his Master’s degree in Business Administration from the University of North Carolina at Chapel Hill. Gates joined HarperLove as the Director of Sales and Marketing following a 33-year career with International Paper and Veritiv in a progression of sales, sales leadership, and marketing leadership positions. He earned his Bachelor of Science degree in Business Administration from the University of North Carolina at Greensboro. Augusto joined HarperLove in 1992 and has led the company’s international expansion. Prior to HarperLove, Augusto worked for Perini Latin America as a Sales Executive and for Banca Nazionale del Lavoro in business development, trading operations and private banking. Augusto is a former member of the Italian Presidential Security Special Forces Unit. He earned his Bachelor’s degree in Mechanical Engineering from I.T.I.S. Galileo Galilei di Roma. Augusto is a member and former chairman of the TAPPI international committee. Tyler came to HarperLove in 2009 as a Technical Service Representative and is currently responsible for leading technical service teams in the Northeast and North Central United States. Tyler has more than 28 years of experience in corrugated manufacturing, having worked in plant operations and plant leadership roles at Packaging Corporation of America, Smurfit-Stone, and Georgia-Pacific. Don Wolfe has been with HarperLove since 2001. He joined the company as a Technical Service Representative and now leads technical service teams in the North Central and Northwest United States. Don has worked in manufacturing operations and leadership roles at MacMillan Bloedel, Weyerhaeuser, and Smurfit-Stone, and has more than 30 years of experience in corrugated manufacturing. Gary joined HarperLove in 2001 as a Technical Service Representative, was promoted to Technical Manager, and is now a Region Manager. He is responsible for and oversees the technical service teams in the southeast and southwest United States. Gary came to HarperLove after 17 years at Container Corporation of America and International Paper where he worked in roles of increasing responsibility in manufacturing, operations management, and plant leadership. Rick has been with HarperLove since 2002 in engineering, production, operations, and leadership roles. As the Operations Manager, Rick is responsible for all aspects of manufacturing, logistics, R&D, testing, and quality assurance. Prior to HarperLove, Rick managed the production operations and laboratory services for a pharmaceutical company. Rick earned his Chemical Engineering degree from West Virginia Institute of Technology.